HIGHEST QUALITY Door sills you can buy! Brushed Finish Stainless Steel Door Outer Sills. Beautifully etch "Viper" with Viper head logo on each sill. 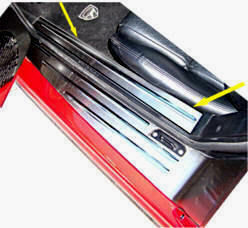 Product contains complete set for Driver and Passenger side door sills. These sills run the entire length of the bottom door sill - all the way up the side to the window. 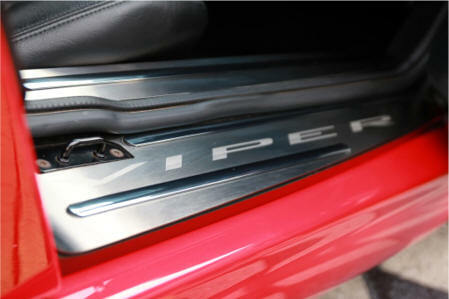 Viper Logo chrome sticker included for each door. Permanent automotive tape on back makes lasting seal. No tools required. Permanent fit. Extremely High Polished Finish Stainless Steel Outer Door Sills. Extremely Brushed Finish Stainless Steel Inner Door Sills. Product contains complete set for Driver and Passenger side door sills. These sills run the entire length of the bottom door sill. Permanent automotive tape on back makes lasting seal. Extremely High Polished Finish Stainless Steel Inner Door Sills.